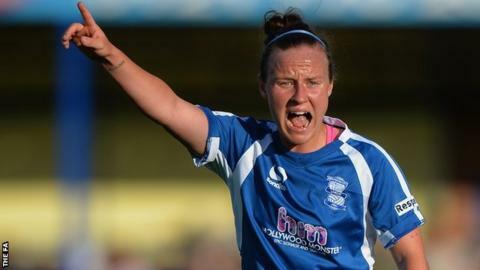 Remi Allen insists ending Birmingham City's six-game goalless run that dated back to April will lift spirits at the Women's Super League One strugglers. The midfielder, 24, netted the leveller in Wednesday 2-1 Continental Cup loss to Notts County. It was Birmingham's third goal in a 10-match winless run, extending from the start of the league season on 29 March. "It was the biggest relief. We can move on now as it gives us a bit of confidence," Allen told BBC Sport. "It is just a starting block for us. We can't hide the fact that it has been difficult for us and we haven't scored many goals, but we knew it was coming." Defeat at Meadow Lane extended Birmingham's losing run to four matches in all competitions and left them third-from-bottom in their Continental Cup group, with Yeovil Town beating Oxford United 1-0 in Thursday's all-WSL 2 tie. In WSL 1, Birmingham are one point and one place above bottom side Bristol Academy. It has taken 10 games for Birmingham City to score the same number of goals than they did in their season opener against Liverpool. Remi Allen is their top scorer in 2015 with two goals. None of the club's recognised forwards, including England's World Cup star Karen Carney, have netted for Blues this season. By the same stage last season, Birmingham City has scored 17 goals. Birmingham City are yet to score a league goal at home this term. "There have been some difficult times," Allen admitted. "But we have turned a corner and feel that we are stronger than ever. These things happen to test us but we will bounce back. "We are Blues and that is what we are about - heart, desire and everything like that. We will come back stronger." David Parker's side next face defending WSL champions Liverpool, who remain the only side that Birmingham have beaten this season, after opening their campaign with an FA Cup fifth-round triumph over the Reds. "It is a massive game. We go out there believing that we can beat everyone - we will believe that on Sunday," said Allen. Elsewhere in the Continental Cup, Arsenal went top of Group One with a 3-0 win over WSL 2 bottom side Watford.